When Champaign-Urbana’s electricity magnate William B. McKinley had the idea in the late 1890s to connect some of the larger cities in Central and Southern Illinois together by rail, he ran into some opposition both locally and from surrounding cities. Compared to Chicago and some of the other cities in Illinois, Champaign-Urbana was small. In 1903 the population was just 17,000 for the twin cities combined. The first proposed line of what would become the Illinois Traction System was from Champaign to Danville, about 30 miles away. At the turn of the century, Danville had a population of 24,000. At the time it was uncertain whether an interurban rail connecting two medium sized cities and the small towns in between would be used, and if it could be profitable. Construction was done by almost entirely by local men. Work began at both destinations - Urbana and Danville – and met in the middle. The construction officially began at the courthouse in Urbana where lines were already in place from the local streetcars, and just west of the public square in Danville. The entire track would be 34.1 miles (Armstrong, 1905) Eleven miles were formerly public highway – an old wagon road – and the rest were cleared to put down tracks. The cost of the venture was about $15,220 per mile of track, totaling $517,500 (Sawyer, 1905) Not included in this figure are two splits in the track that headed to coal yards. These coal yards would become important in later years for Illinois Traction. The construction of the rail line was quick; in fact a little too hasty – once it was completed engineers was realized that there were sixty-one curves in the track that would be uncomfortable for riders if taken at a cruising speed of forty miles per hour, and therefore the cars would have to run slower. The track would eventually be straightened after the interurban line opened, but it would be a costly venture for Illinois Traction in later years. By 1905, just two years after the first interurban ran from Urbana to Danville, the Illinois Traction owned six passenger cars of varying lengths, twenty-three coal cars, and several construction cars. Four passenger cars made regular runs, and the goal was that at least one interurban would stop at each terminal every hour. Terminals were located in Champaign, Urbana, St. Joseph, Ogden, Fithian, Oakwood, and finally Danville. For the first few years, the railroad was averaging an income of $120,000 per year and served about 51,000 people. By 1930, approximately eight cars ran between Champaign-Urbana and Danville per day. 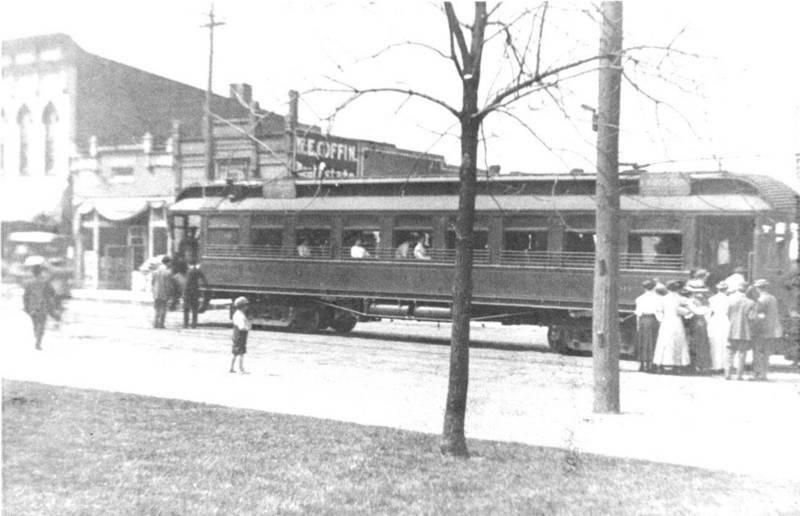 On the original route, the electric interurban entered Urbana from the east on Main Street and the passenger car would stop at the depot before proceeding on to Champaign via the electric trolley rails (Sawyer, 1905) Most likely the interurban traversed Springfield Avenue, traveled north on Wright Street and then west on University Avenue, stopping at the Illinois Traction Depot on the corner of University Avenue and Market Streets; according to the street trolley map, this route used the least amount of turns, which caused most delays. When the line to Decatur was completed a few years later, the interurban would take University Avenue west, head south on Neil Street, and west on John Street to get out of the city. The Illinois Terminal depot in Champaign was built in 1913; it served as the interurban depot, a streetcar depot, and headquarters for the Illinois Terminal Railroad and McKinley’s Gas and Electric Company. It still stands today at 23 E University Avenue and is listed on the National Register of Historic Places. The depot in Urbana has a more mysterious history. The location of the original depot was 120 W Main Street, which in 1905 was also the address for Busey’s Hall and bank offices, and by 1915 was the Princess Theater (Sawyer 1905). It is unclear when and where exactly the depot moved. With the slow decline of the Illinois Terminal, passenger service began to lessen and the last electric interurban to provide passenger service to Champaign came through in 1955. Shortly after passenger service ended, the entire length of railroad track east of Urbana, including the line to Danville and the splits to the coalmines, were removed. Since the Illinois Terminal Railroad was running long after the local streetcar service ended in 1936, most of the rail lines used to get through the two cities were never removed and can sometimes still be seen during road construction. Interurban picking up passengers, unknown date: This image shows one of the interurbans picking up passengers on Main Street in Urbana. Image courtesy of the Champaign County Historical Archives. Brehm, Kara, “Champaign-Urbana-Danville Interurban, 1903,” ExploreCU, accessed April 22, 2019, https://explorecu.org/items/show/203. Armstrong, C.E. (1905). Interurban car tests on the Illinois Traction System. University of Illinois. Changon, S.A. (2007). The History of Railroads in Champaign County. Mahomet: Changnon Rails. Morgan, R.L. (1969). Cornsilk and Chaff of Champaign County. Sesquicentennial Committee of Champaign County, Ill. Sawyer, F.S. (1905). Construction of the Danville, Urbana, Champaign Interurban Railway . University of Illinois. Schlipf, F. (1973). Combined Atlases of Champaign County 1893, 1913, 1929 . Evansville: Unigraphic, Inc. Scott, T.W. (1951). Geography of the Illinois Terminal Railroad. Urbana: University of Illinois.